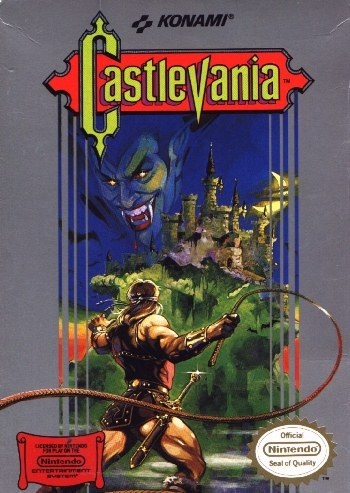 Castlevania is a platforming video game developed and published by Konami for the Family Computer Disk System video game console in Japan in September 1986. It was later released for the MSX2. It was ported to cartridge format and released in North America for the Nintendo Entertainment System (NES) in May 1987 followed by a European release in 1988. The game takes place in the year 1691 where players control Simon Belmont who is tasked with defeating the vampire Dracula. It was re-released for the Family Computer (FC) in cartridge format in 1993. It is the first game in Konami's Castlevania video game series; it was followed by two more NES games titled Castlevania II: Simon's Quest (released for the NES in 1988) and Castlevania III: Dracula's Curse (1989). A fourth game was released for the Super NES and titled Super Castlevania IV. Castlevania is often considered to be one of the best games on the NES. It has received critical acclaim ever since its original release. It sold impressively and is considered an NES classic by PC World, while Nintendo Power and Game Informer ranked it in their best video games list (at 22 and 48 respectively). IGN ranked it 19 among their favourite NES games. Castlevania uses platform gameplay and gives Simon a Magic Whip to use as his standard method of combat as well as move and jump. Simon's whip has a delay between the player's button input and Simon's use of it. Simon has a life meter and begins with three lives. When his life meter is depleted or he falls into a pit, he will lose a life. Once he loses all lives, he begins at the beginning of the block of stages players are in (of which there are six). Each screen transition leads to a new stage; players will eventually reach an area where they have to deplete a boss' life meter which allows them to progress. Players can replenish health by finding hidden meat in the walls and can gain a new life by gaining a certain number of points (which are gained by defeating enemies, picking up money bags, and completing a block). Simon can find items called sub-weapons that have different uses. The Knife can reach across the screen; the Holy Water can attack lower enemies and freeze them; the Axe can attack enemies in the air; the Cross goes for a time and returns to Simon; and the Stop Watch stops certain enemies for a short period of time. Players can only carry one item at a time and loses the item when they die. Whenever an item is used, it costs hearts. All items use only one heart except for the Stop Watch which uses five. Players may find items by defeating enemies or breaking candles. These items can include hearts, money bags, whip strength/length upgrades, and sub-weapons.